Medbery Park is located on the north side of the White Lake channel that is shared by Whitehall and Montague. Better known to kiteboarders as “The Honey Hole” it’s often times used as a launch point for down winders to Little Sable Point. There are two jetties on the North and South side of the channel. This creates nice smooth waves at Medbery on a south wind and flat water by the north jetty. Thursday the air temperature was nice and warm yet the water was still cold at around 50 degrees. This along with the slight offshore wind meant we didn’t get much in the way of waves. The wind was around 16-20 knots most of the evening and I while I could have used a little more power it was still a great session. The wind was strong enough to have some decent floaty jumps and there were some small waves that created nice kickers for throwing backrolls. I finally brought some cameras and had time to take a little video and some pictures. 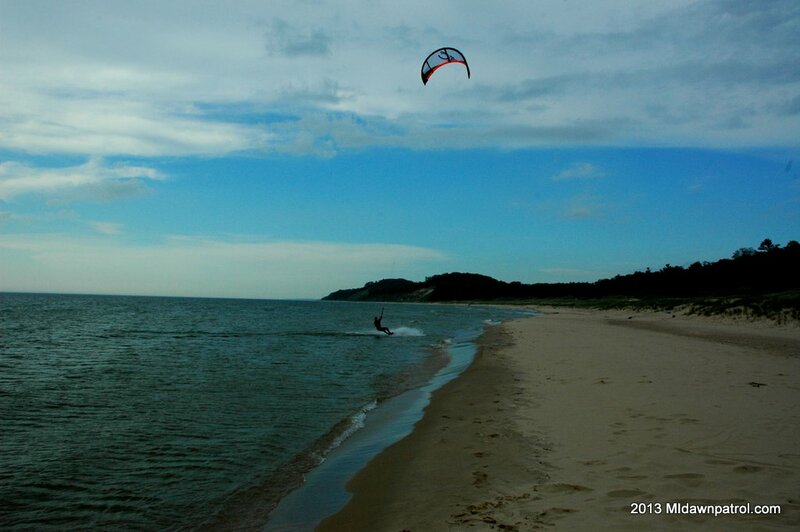 Medbery Park Montague Michigan Kiteboarding from Michigan Dawn Patrol on Vimeo. As much as I like Medbery Park, I’ve had minor kitemares the last two sessions. During my first session my safety released on accident and my foot got tangled up in kite line, the second session my kite just dropped while jumping and inverted the kite lines. Luckily I didn’t have any problems other than trying to get back to shore. Part of the reason why Medbery can be a little difficult if you get in trouble is the fact that a straight south wind is slightly off shore. If you have problems on the water like I did you will have a little more difficulty getting back to the beach.